The Kamchatka Brown Bear, is one of the largest bear species, (the same species inhabits Kodiak Island in Alaska). The average size of a mature Kamchatka bear is approximately 8.5 feet with a 25-inch skull. The Eastern-Siberia Moose inhabits Kamchatka, with a population of about 2000 animals living in central Kamchatka peninsula and 2500 animals in the north. A mature bull weights approximately 650 kg (1430 pounds); the average antlers spread is 160 cm (63 inch). 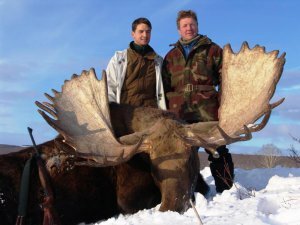 The biggest moose taken by our client in December, 1997 was 69.1 inches, in 2010 - 73,8 inches, in 2011- 72,4 inches. The Kamchatka BigHorn inhabits the mountains of 5000 - 6200 feet altitude. Current populations are about 7500 animals on the peninsula. There are 5500 of the Koryak Snow Sheep inhabiting 2600 - 5500 foot mountains. A mature ram weights 80 - 95 kg (176 - 210 pounds); the average length of horns is 85 -87 cm (33 - 34 inches). The age of the majority taken by clients, is 9 years. 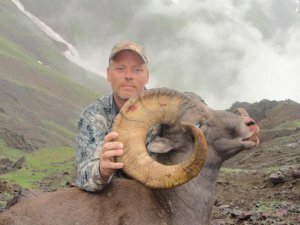 The biggest trophies taken by our sheep hunters were a 41-inch Kamchatka BigHorn and a 39-inch Koryak Snow Sheep. 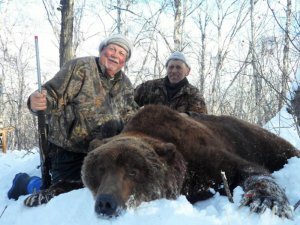 Sport hunting does not threaten the population of snow sheep in Kamchatka; the main enemies of snow sheep here are wolves and snowy winters. Trapping fur animals has been very popular in Russia for centuries; sable, ermine, squirrel, mink, otter, wolverine, lynx, red fox, polar wolf, and hare. All these animals are trapped in our areas. Our professional guides trap from November until February. All materials on this site either a property of Utgard Ltd. or have been granted usage by third party. Use of materials from this site is only possible upon request.